The first track, Happy Song, was released two weeks ago now, and the build up to it was phenomenal. Ridiculous quizzes were posted online, backmasked videos were uploaded, and pictures of the umbrella were plastered all over the Internet, on billboards, road signs, telephone poles, and pretty much EVERYWHERE YOU COULD POSSIBLY IMAGINE. #bmth #☔ caught this out in Shoreditch today – if only I knew what it BLOODY MEANS! When Happy Song was finally released it was clear that the band have continued on down their alternative route, with a much more prominent electronica influence than we’ve previously heard from them. The intro starts off with childlike chants, which is almost reminiscent of the operatic choirs we heard on Crucify Me, off the third album, There Is A Hell, Believe Me I’ve Seen It. There Is A Heaven, Let’s Keep It A Secret. Oli Sykes’ vocals have changed dramatically too, which wasn’t too much of a shock for the major fans, as he’s been gradually screaming less aggressively with every new release over the past few years. Happy Song features more straight up singing with the occasional powerful shout that verges on the edge of a scream, much like Drown, which was released late last year. Throne is the most recently released track, and was also named as Annie Mac’s Hottest Record In The World, which should be the biggest indication that the band has changed their sound drastically. Throne has a much more electronic sound than Happy Song, which ties in well with the vocals and sounds almost like Can You Feel My Heart, from the band’s last album, Sempiternal. Throne, on the other hand, has that perfect IN YOUR FACE element to it, that you can imagine screaming at everyone who’s hurt you, while also sounding like an ideal rave tune, but with heavy guitars and fast drums. It’s the lyrics I love with the music I live for. It could be argued that the band has changed their sound too much since starting out, and that they’re not even the same anymore. I think the gradual change made it much more natural and organic, and it’s made me love the band as they were, and as they are now. It’s safe to say that I am now trembling like a leaf for their set at Reading this year! Great article, I’m totally agreeing with you. 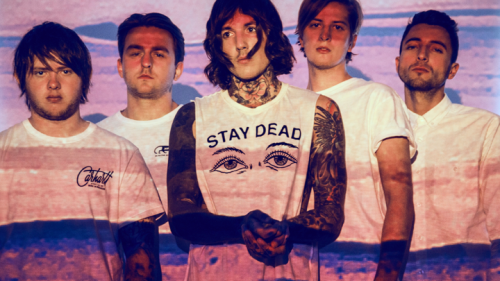 BMTH was, is and will keep on being an awesome and inspirational band 🙂 so looking forward to seeing their performance at reading!